Ahead of this morning's out of PLACE launch (see more info here), Dan Thompson of the Empty Shops Network and Amberlea Neely of PLACE spoke on last night's Arts Extra (the piece is at the beginning of the show). Also note that today's launch is at out of PLACE on Castle Lane, rather than PLACE on Fountain Street as mentioned on the show. Now available in our bookshop for £21. In the 1980s, there was much discussion of so-called sick buildings syndrome. This involved the inter-connected environmental problems caused by issues such as radon gas, poor air conditioning, solar gain etc. Psychological concerns were also at play when workers couldn’t control the temperature nor open windows in the hermetically sealed offices of the 1960’s and 70’s. Many problems have now been addressed through retro-fit, etc. The debate has moved on to the creation of healthy places rather than solving sick environments. In Northern Ireland there is a wide variety of public agencies, private companies and NGOs that have roles in creating our environment. We have a somewhat fragmented government. Until recently agencies acted in isolation to deliver only their own component of cities, be that housing (NIHE), roads (DRD), urban regeneration (DSD) or planning (DOE). We also have a reactive planning system. One positive thing that has developed here over the last few decades is a very direct relationship between local communities and their elected representatives driving issues such as places for play. These politicians are now back in control of decision making, and by and large they recognise the problems of disconnection. Locally, we have created some particularly good buildings for churches, education, leisure, art and drama over the years. 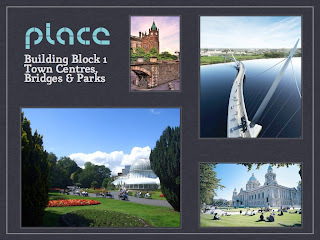 It would be wrong to be totally critical of all aspects of Northern Ireland cities. 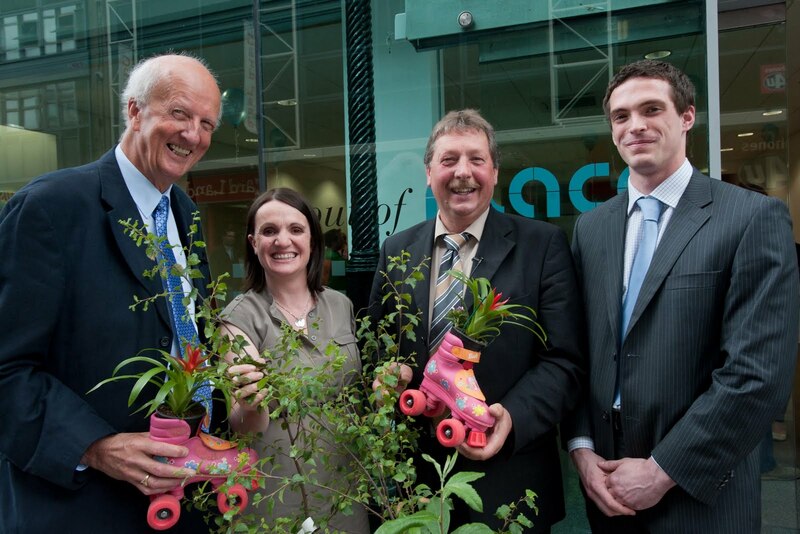 For example, Health Estates NI have received numerous awards for good buildings. However many aspects of our cities do not perform well under scrutiny and have a negative impact on our general health and well-being as citizens. Over the centuries the greatest human minds have created models of ideal cities. The concept of a Healthy City is first explored by Plato. Early in Republic, he depicts two cities, one healthy and one with 'a fever' (the so-called luxurious city). The citizens of the luxurious city "have surrendered themselves to the endless acquisition of money and have overstepped the limit of their necessities". The luxury of this city requires the seizure of neighboring lands and consequently a standing army to defend those lands and the city's wealth. The main character, Socrates, says that war originates in communities living beyond the natural limits of necessity. 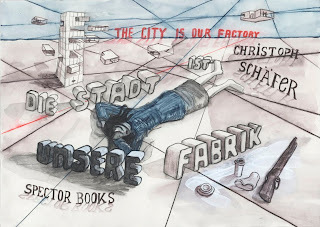 In short, the healthy or true city is sustainable, limiting its consumption to actual needs, while the luxurious city is not, and is in a perpetual quest for more. Plato spends the rest of the Republic attempting to reveal the political organization and virtues such as moderation that become necessary for the luxurious city to be more just, more healthy, and thereby sustainable. While Leonardo da Vinci was living in Milan, much of Italy and the rest of Europe was struck by plague. Leonardo felt the high number of deaths was partially due to the condition of the dirty, densely populated cities where germs spread rapidly. He saw garbage thrown out onto the narrow streets and there was poor sanitation. Leonardo designed an "ideal city" where the streets were wide, underground waterways carried garbage away and a paddlewheel system could clean the streets. His city was based on 2 levels, the top level was for the foot traffic and the bottom for carts and animals. In this city, Leonardo hoped that improved living conditions would help to avoid the spread of contagious diseases. While the ideal city was never built, he did help to improve the Sforza castle by designing a smaller version of his plumbing and drainage system which proved to be both clean and efficient. A century after Leonardo’s model, work began on the first planned city in Ireland, London’s new city on the site of the long established monastery town of Doire in 1613. The central diamond within a walled city with four gates was considered primarily to be a good design for defence. The main streets were wide and the buildings make visual reference to the renaissance. More than two hundred years after the growth of Derry, the Victorian City planners of Belfast looked at classical and renaissance Southern European city models for inspiration. Belfast expanded very rapidly from being a market town to an industrial city during the course of the 19th century. It is not an agglomeration of villages expanded into each other like Manchester or Birmingham. The arterial roads along which this expansion took place tend to define the districts of the city. Also the landscape generates the city as much as the imposed plan and Belfast expanded to the natural barrier of the hills that surround it. In 1898 Ebenezer Howard founded the Garden city movement in England. The cities were intended to be planned, self-contained, communities surrounded by greenbelts, containing carefully balanced areas of residences, industry, and agriculture. His initiative was inspired not by Plato but by the Utopian novel Looking Backward written by american Edward Bellamy. Howard’s idealised garden city was planned on a concentric pattern with open spaces, public parks and radial boulevards. The garden city was intended to be self-sufficient and when it reached full population, a further garden city would be developed nearby. Howard envisaged a cluster of several garden cities as satellites of a central city linked by road and rail. Many towns in England and elsewhere are based on Garden City Models. Locally we have small estates in Belfast and Derry inspired by the model. Later variations from Walden to New Towns such as Crawley and Milton Keynes have all sought to create the ideal town or city. In 1963, under the Matthew Plan, the new city of Craigavon was founded out of the original towns of Portadown and Lurgan. This plan is incomplete for various reasons. The plan initially was to construct a relief settlement to take people out of the crowded city of Belfast. This did not work. Portadown and Lurgan still exist while Craigavon does not. Ring roads, zoning, and other key components of the Garden City continue to have significant influence on planning and the places we inhabit. Garden Cities depended on infrastructure such as goods trains and public transport connectivity. However, in NI we have very poor rail infrastructure - the train from Derry to Belfast has a journey time almost an hour longer than the equivalent car journey. The train lines pass Belfast International and City of Derry Airports but without a halt. The Ville Contemporaine was an unrealised project to house three million inhabitants designed by the French-Swiss architect Le Corbusier in 1922. The centerpiece of this plan was to be a group of sixty-story cruciform skyscrapers. These housed both offices and the flats of the most wealthy inhabitants and were set within large, rectangular park-like green spaces. At the centre of the planned city was a transportation center for buses and trains, as well as highway intersections and at the top, an airport. Le Corbusier, like Leonardo, segregated the pedestrian circulation paths from the roadways, and glorified the use of the automobile as a means of transportation. As one moved out from the central skyscrapers, smaller multi-story zigzag blocks set in green space and set far back from the street housed the proletarian workers. Le Corbusier’s ideas were less influential than his drawings. Many sub-standard, poorly conceived high-rise communities were constructed in the post-war years. The systemised deck access housing constructed at Divis in Belfast and Rossville Flats, Derry were quick cheap attempts at slum clearance and housing provision by the Northern Ireland Government. They were initially welcomed by tenants who gained larger bedrooms and better equipped kitchens however as elsewhere in Europe these systems soon proved to be a social disaster. Other post-war policy initiatives such as the Clean Air Act 1956 have had a much more straightforward beneficial impact on our health. Over the years our towns and cities were built on whatever land could be purchased, on a field-by-field basis. In this way the streets retain the field pattern. The twists in the landscape which had become land divisions became translated into the urban form as a memory. This kind of growing, organic, self-repairing city fits into a view of architecture and urban design where intuitive decisions are valued as much as grand visions, where the specific place is more important than the general location. This view has been given intellectual rigour and structure by theorists like Christopher Alexander. Northern Ireland society has changed; complexity has replaced simplicity. It is time once again to repair and renew our cities. The lesson of the past is that this should not be a grand gesture. What is needed is a whole series of small acts of intuitive and appropriate design. Every act of building should be an act of repair, a part of the much larger process, in which several acts together regenerate the whole city into a healthy place. PLACE has a history of challenging government policy to try to encourage better and healthier environments. For example the Happy to Live Here? 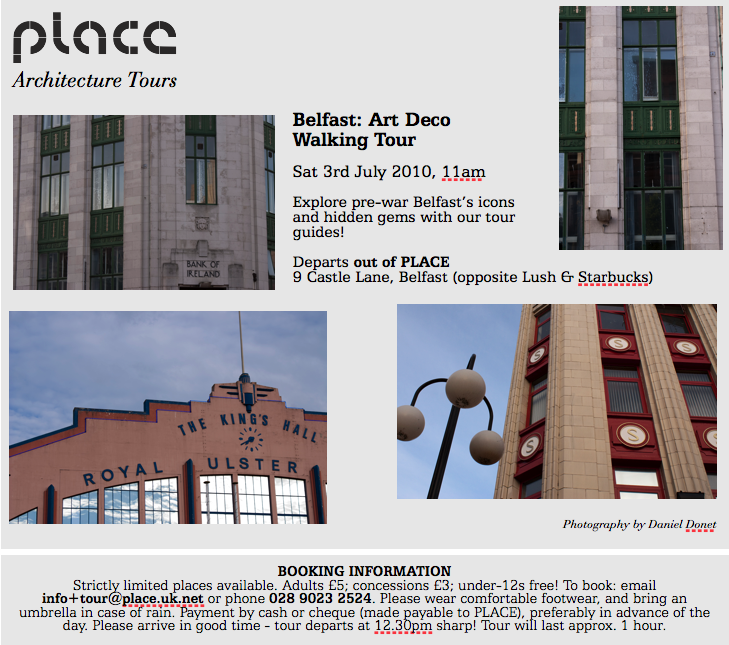 exhibition created by two architects working in Belfast, Mark Hackett and Declan Hill (also founder members of the Forum for Alternative Belfast) was originally shown at PLACE in November 2005. The starting point was a review, in text and photographs, of the DOE Housing Policy Initiative first released in January 1996. The Policy was published as a guidance document, “Creating Places: Achieving Quality in Residential Developments” in May 2000. The exhibition questioned how policy has impacted on housing since 1996 including the orientation of houses, car parking, street layouts, the re-use of old buildings, possibilities for apartment living and home energy costs. The exhibition and accompanying booklet pays much attention to the generally poor quality of public spaces, amenities and infrastructure around housing developments. Looking forward in terms of changing policy perhaps the most important initiative will be a new Planning Policy Statement ‘Planning for a Natural & Healthy Environment’ published on 10th March 2010 for consultation. The policy aims to: conserve and enhance the natural environment, minimise vulneralbility of places, people and wildlife to climate change, deliver safe and attractive places to live and provide access and recreation opportunities in rural and coastal areas. Planning is one of the powers to be moved to local councils under RPA and there is a current initiative to quicken planning processes primarily to aid economic development. Meanwhile in the last few weeks DOE has announced that Planning Service staff will be cut by 30%. Approximately 30 Peace Line walls still divide fourteen districts in Belfast and one in Derry. These are the most visible remainders of a conflict legacy. Roads such as the M3 flyover and the Westlink separate the largely uninhabited city centre of Belfast from surrounding neighbourhoods. A public transport strategy is dependent on roads due to long-term underinvestment in railways. Investment in roads promotes private car use as much as it facilitates public transport. Existing railways pass beside all 3 N.I. Airports and yet they are not interconnected. A proposed rapid transit bus system for Belfast is to be funded only after major roads works elsewhere in Northern Ireland. Children are still driven to school with only sporadic successes through local walking-to-school initiatives. We have a number of compact, legible and easily walked city centres, in Belfast, Derry and other towns across NI. Our built heritage has remarkably been substantially preserved despite bombing campaigns, slum clearance and roads projects. Belfast is surrounded by mountains that create a special micro-climate conducive to horticulture. From the Victorian Botanic Gardens to Cave Hill Country Park, Belfast has over forty public parks, all in close proximity to the city centre. Parks and Gardens provide places for a picnic, a stroll or a jog. New foot bridges are being constructed throughout Northern Ireland along a series of cycle and footpaths designed to encourage more people to exercise. We need to face up to challenges such as alternatives to the school-run by car. 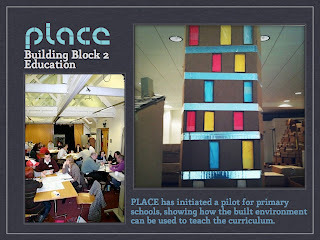 PLACE this year trained Primary School teachers and built environment professionals with practical skills to introduce architecture and the built environment as teaching resources via the existing curriculum. 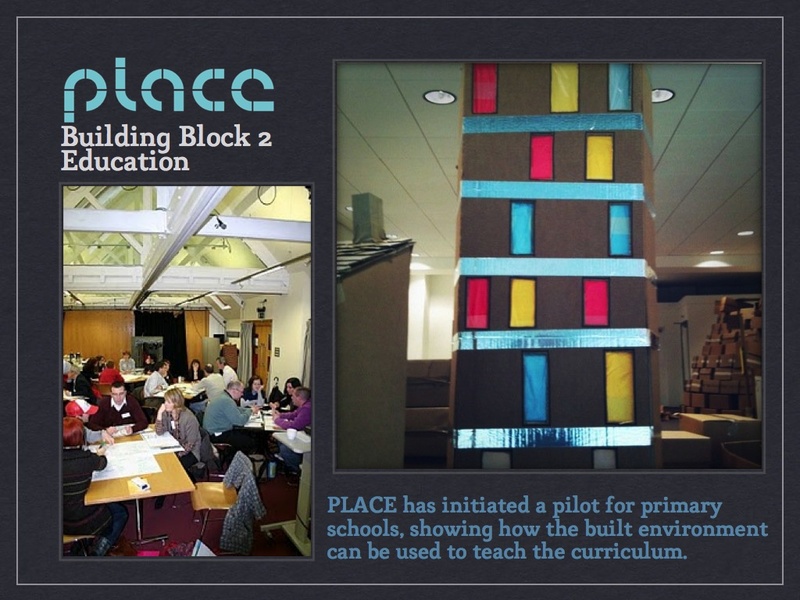 This is being undertaken currently in eight schools on a pilot basis around Northern Ireland. Our towns and cities are a freely accessible learning resource through which we can explore maths, geography, language and almost any other subject. Architecture in the Curriculum will begin the process of encouraging everyone to better understand the spaces and buildings we inhabit and the ideas that have created these places. Healthy Environments are already on the mainstream agenda within University Planning and Architecture departments - for example, the University of Derby MA in Sustainable Architecture and Healthy Environments. 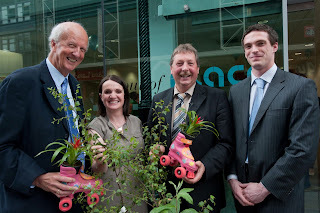 Since 2001 DSD and Belfast City Council have developed a number of cultural quarters. 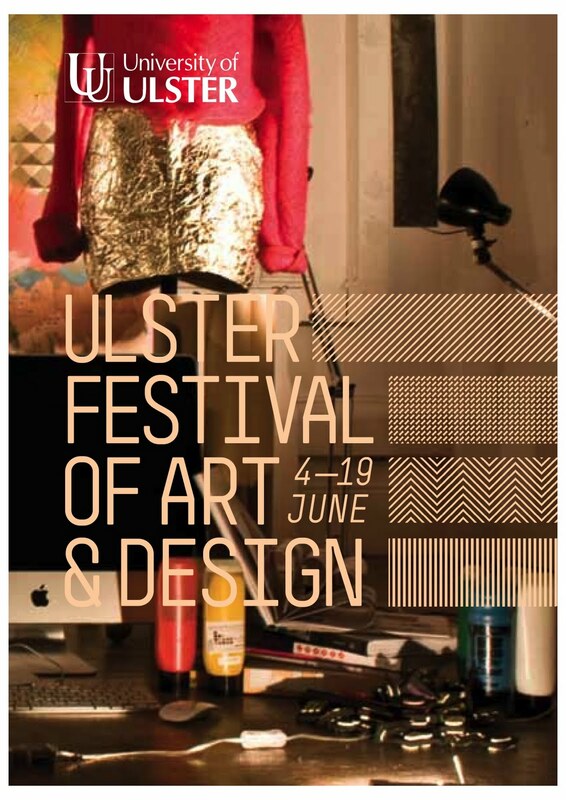 The Cathedral Quarter has taken on the mantle of the city's key cultural locality. 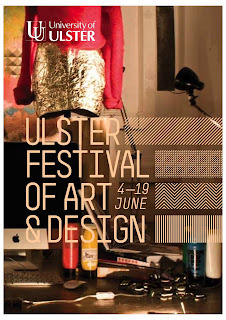 It has arts centres, galleries and hosts a yearly visual and performing arts festival. Nearby Custom House Square is one of the city's main outdoor venues for free concerts and street entertainment. 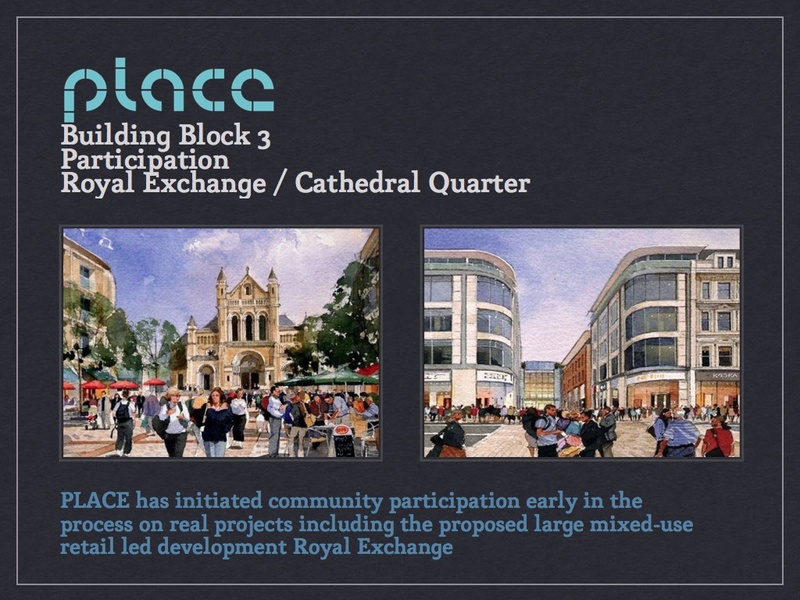 The site for the major Royal Exchange mixed use development overlaps into Cathedral Quarter. 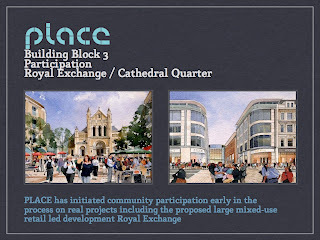 PLACE has engaged with the developer to promote community participation in this potentially contentious major development. The developer has approached this in an open way and engaged. 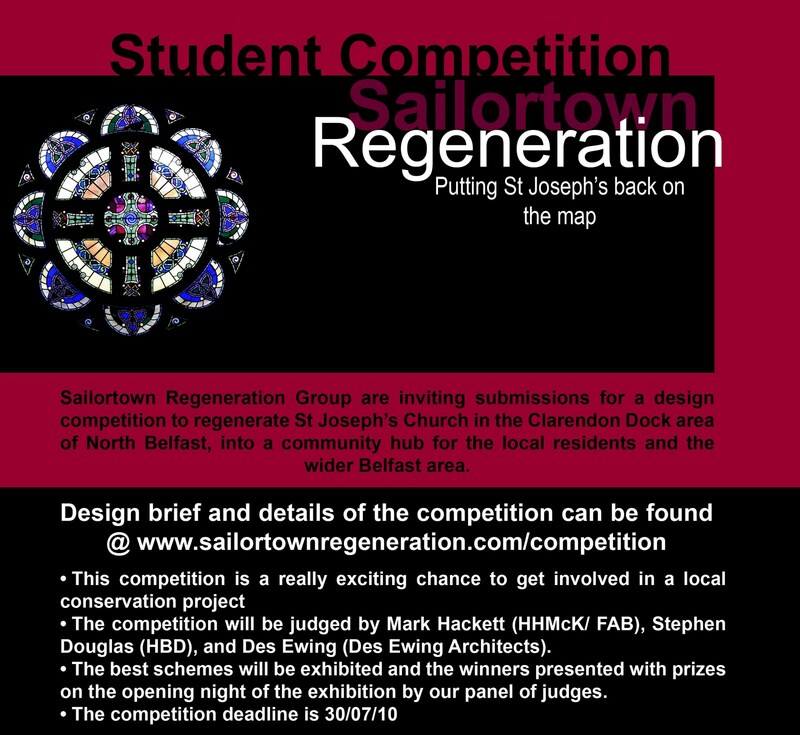 In parallel, Planning in Northern Ireland is being reconfigured to frontload consultation. The Gaeltacht Quarter around the Falls Road in West Belfast promotes and encourages the use of the Irish language. 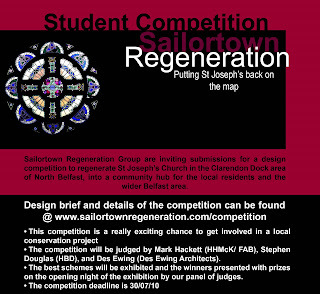 DSD have also developed a regeneration strategy for the adjoining area - Andersonstown Gateway. 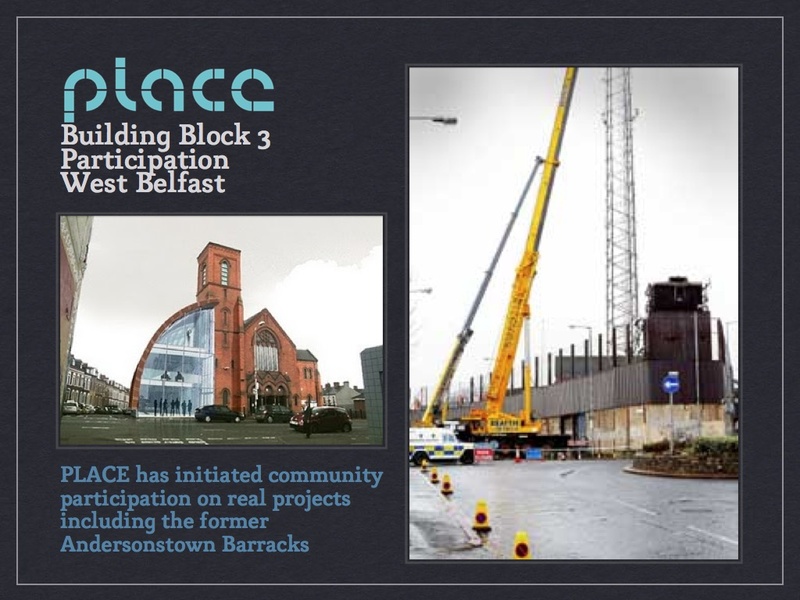 PLACE is working with West Belfast Partnership Board and DSD Belfast Regeneration Office to help redevelop the contentious former police station site for a community-led regeneration project. This will go to an international design competition and Daniel Libeskind has agreed to chair the Jury. In the Waterside area of Derry, PLACE is working on the transformation from former military site to public greenspace including play areas in a collaboration between DSD, Derry City Council and local community. The site for the major Queen’s Parade mixed-use development lies between Main Street and Bangor Harbour. PLACE has engaged with DSD, North Down Council, the local MP and the developer to promote community participation in this previously contentious major development. The developer has approached this in an open way and engaged. "Active Places: building healthy environments" was hosted by Belfast Healthy Cities in collaboration with the UKCRC Centre of Excellence in Public Health (Northern Ireland) and the Institute of Spatial and Environmental Planning at Queen’s University of Belfast and PLACE, the Architecture and Built Environment Centre for Northern Ireland. 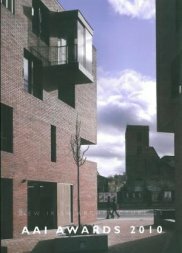 This book documents the AAI Awards 2010 in book form as the 25th volume of best-selling New Irish Architecture series from Gandon Editions. This book features all 21 entries selected by the jury, it includes photographs and drawings as well as detailed descriptions of all of the entries. Projects include, The Alzheimer's Respite Centre, Dartmouth Square Dublin 6 as well as projects by DTA Architects, LID Architecture and MAC Gabhann Architects.